The VacuPress® utilizes a continuous vacuum to dry, while heating with aluminum hot water heating plates. 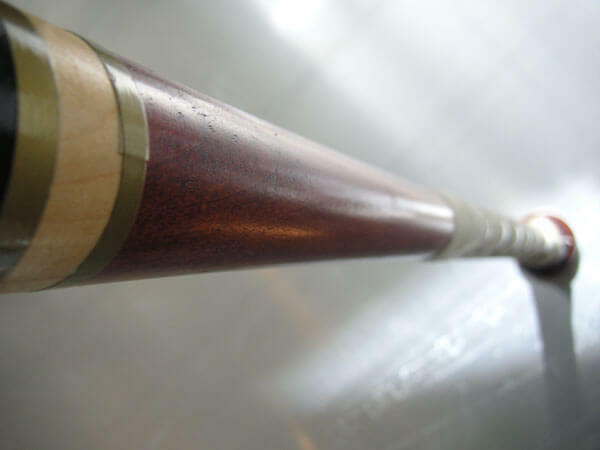 This dries wood up to 10 times faster than conventional methods, and the added benefit of the rubber membrane has made it possible to keep the lumber flatter and straighter than ever before. 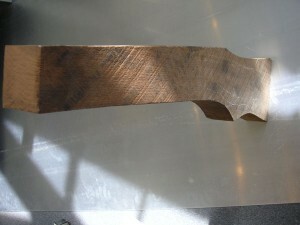 The VacuPress uses a vacuum to create a pressure gradient between the shell and the core of the wood. Conventional drying methods rely on moisture differential or gradient to move the water from the wetter core toward the dryer shell. This can be a slow process since the operator must be careful not to over dry the shell or degrade will result. 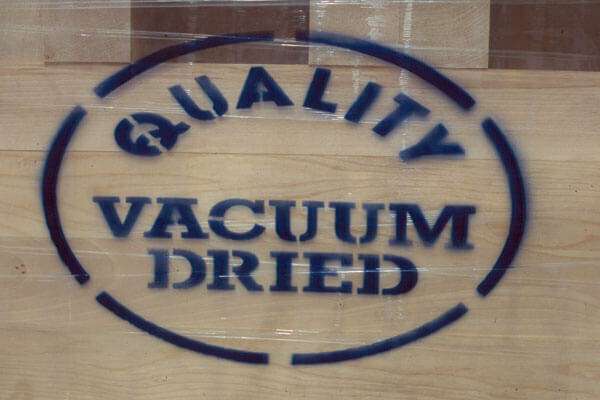 The VacuPress achieves its fast drying rates by maintaining a small differential between the shell and the core moisture contents throughout the drying period. 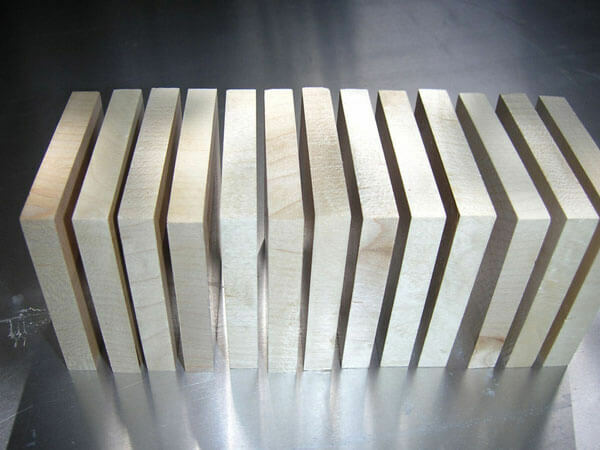 Typically, the core of the wood is essentially at atmospheric pressure, while the shell of the wood is at a much reduced pressure, causing the water to flow toward the shell more rapidly. 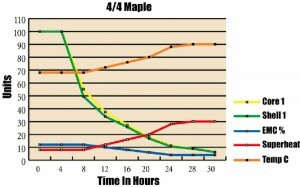 When drying lumber it is necessary to increase the temperature while maintaining a vacuum (see Diagram 1). This causes the environment within the dryer to become superheated and therefore the equilibrium moisture content is reduced causing the moisture from the wood to convert to water vapor at the reduced pressure. The moisture from the wood can then be condensed and removed from the pressure vessel and drained via the vacuum pump. Now on to the rubber membrane. 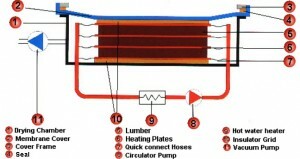 The VacuPress rubber membrane which is placed on top of the lumber pile, then collapses on top of the lumber during the drying process (see Diagram 2). 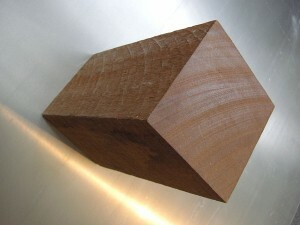 Heating the lumber is necessary to circulate water within the wood and bring it to the surface so that it can be evaporated as steam, which either condenses on the cool walls of the pressure chamber and runs to drain or is drawn out of the pressure chamber by the vacuum pump as steam. VacuPress kilns use aluminum heating plates, which are heated by hot water that is circulated within the plate (not unlike a radiator). This heating system is very effective at heating the wood without damaging or darkening it due to the low pressure(vacuum) environment, in fact the low oxygen environment actually contributes to the bright colors that result from the vacuum drying process. Hot water heating plates are also a very economical method of heating the wood, because the water can be heated by almost any boiler system (i.e. Wood Waste, Gas, Propane, Oil or Electric). All VacuPress models promise the same reliable and efficient drying time, using a combination of heat and vacuum, VacuPress dries lumber and squares from 4/4 to 16/4 ten times faster than conventional kilns. The Benefits of a VacuPress System. What’s in it for you? Think of the money you save – by drying 10 times faster. You turnaround your product 10 times faster, which puts money in your pocket 10…actually 10.5 times faster…weirdly enough! Or think of the time you save. What if you could turn a log into flooring and sell it in a week? A VacuPress with the capacity of 12000 board feet will dry close to 2 million board feet of 4/4 hard maple in a year. Vacutherm gives you an energy cost of pennies per board foot. Low electricity demand and very low and efficient use of heat energy means you dry faster with a smaller boiler and minimal electricity. Think home heating system size boiler and clothes drier size electrical demand! 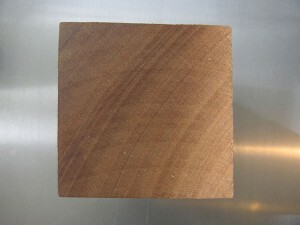 Wood dried in a VacuPress dryer is free from oxidation and staining, resulting in brighter, richer and whiter (in the case of white woods) color than can be achieved in any other method of drying, especially for difficult to dry species. 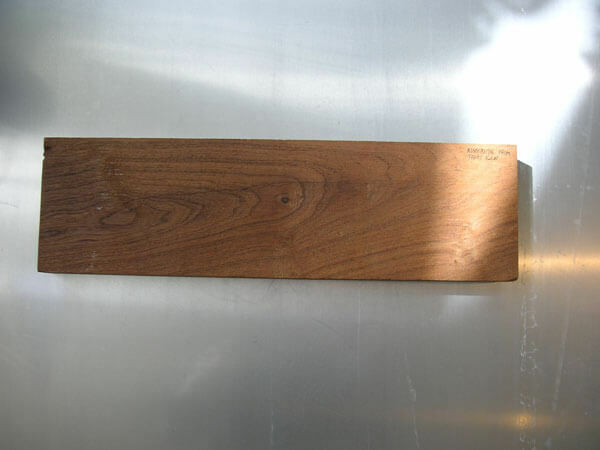 As a result of Vacutherm’s EZDRY process, the wood is allowed to give up moisture in a way that does not over dry either the Core or the Shell. 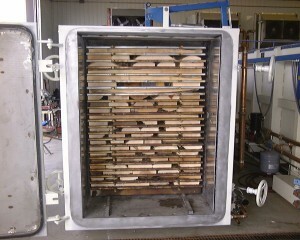 As a result, stress tests done on wood dried in a VacuPress yield better results with no input from the kiln operator. No stickers are used during drying. which means no sticker stain. And after drying is done the lumber is ready to be dead piled and moved to the next stage of processing or to the customer. Get more out of every load. 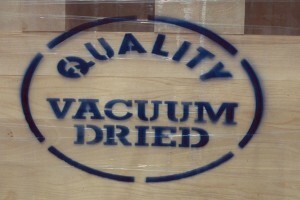 Lumber dried in the Vacutherm Vacuum Press Dryer is free of distortion with no twisting, bending, or cupping. Degrade such as checking and honeycombing is also significantly reduced as a result of Vacutherm’s patented control of heat. Lumber dried in the Vacutherm Vacuum Press Dryer is flat and stress-free, with uniform moisture distribution, and no stain or discoloration. “Cash Flow Machine” – VacuPress dries your product 10 times faster which puts money in your pocket 10 times faster. No Building Needed: In most cases we can install the VacuPress in an unused area of your building or even in an old conventional kiln. With a machine that measures 25 ft by 6 ft by 7 ft. you can dry 1 million board feet a year. The VacuPress uses very little electricity, because there are very few moving parts (no fans) and you have the option of hooking into your existing wood fired boiler for a heat source, making the operating cost for the VacuPress pennies per board foot. Easy To Use: In a few hours anyone can be instructed to use the kiln. There is no need to hire a kiln operator and, the wood is stacked between the hot water heating plates, so the wood goes from the log to the kiln without stickering. Vacutherm believes in selling VacuPress technology to only those companies that display the best potential for the technology. This means that if you have the best application for our kiln and you have a sound and healthy business, you will see a significant return on your investment in a short period of time. Our objective is to help you grow your business’s profitability and the quality of your product. To get a more specific idea of how quickly the VacuPress will pay for itself you may call us or use the calculator below. Use this calculator to see if owning and operating a new VacuPress kiln is affordable for your mill. Choose the model, the species you want to dry, and the thickness to see how much you can produce in a year. The numbers are based on a 340 working day year and conservative drying times. Vacutherm makes it easy for you to own a new VacuPress by providing affordable Financing options that best suit your business. Leasing your VacuPress is a low risk option that allows you to start paying when you start drying. If you prefer to purchase a VacuPress without financing or wish to finance a VacuPress yourself, please call us so that we may generate a quote based on your specific needs. Use the Calculator to see if the VacuPress is affordable for your business. For more information about our Leasing Program and how to apply please. $0 Down: Customers with good credit may be eligible for financing with no down payments, which means you starting paying when you start drying! Save Cash: With Leasing you don’t have to tie up valuable credit or cash in a loan or large capital equipment. Leasing allows you to save cash that can be used for marketing or overhead expenses. Tax Benefits: Unlike loan payments, lease payments may be fully tax-deductible as an operational expense (please consult with your accountant – laws vary between Canada and U.S.). Upgrade: Adding additional drying capacity is easy. Upgrade the size of your VacuPress or add an additional kiln to your existing lease program by just rolling it into your lease payment. It’s Easy: Leasing typically requires less documentation than bank financing and fewer internal approvals than a capital purchase. For more information about our Leasing Program or for Purchase Prices please contact us today. Use the Production Calculator and/or Cash flow Demo to see if a VacuPress Kiln is affordable for your business. For more information about our Leasing Program and how to apply please contact us. Kiln operators will wonder why it took this long to get a kiln control that just works and doesn’t take a computer programmer to run. EZDRY is a revolutionary autonomous drying program and REALLY WORKS!